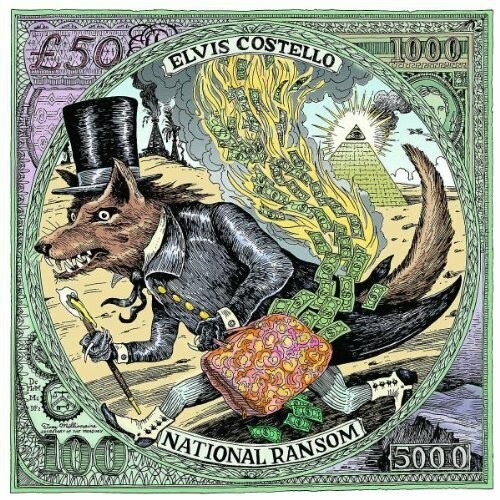 Just like with last year’s Secret, Profane & Sugarcane, Elvis Costello again travelled to Nashville for a few days to record with T Bone Burnett for his latest album, National Ransom. He must’ve enjoyed himself the last time he was here because his repeat performance trickled all the way down to using the same cover artist and the same musicians. Jerry Douglas, Stuart Duncan, Dennis Crouch, Mike Compton and Jeff Taylor were once again called on to produce the proficient, rootsy, Americana-flavored sounds Elvis and T Bone were looking for to frame the new songs. But with National Ransom’s more aggressive, incensed lyrical direction came a need for a little more musical bite. So while all the down-home charm and bluegrass chops of Secret, Profane & Sugarcane are present, some new elements like drums, organ, electric guitar and horns have been added to give these songs the extra weight they need to hold Costello’s scathing lyrics. Touching on governmental irresponsibilities, the recession, floods, religion, shady and/or sympathetic characters and the oft-covered but endless possibilities of love and heartbreak, Elvis Costello delivers another intelligent, clever, verbose, sometimes playful and sometimes distressed view of our times and situations. Even before you hear the first note from National Ransom, a look at the liner notes will assure you that these songs are in good hands. Elvis’ impressive guest list includes those that show up for just a song or two like Buddy Miller, Leon Russell, Vince Gill, Jim Lauderdale and ex-Imposter Davey Faragher, as well as those that play on pretty much every song like Marc Ribot and ex-Attractions Steve Nieve and Pete Thomas. It’s those previous bandmates, including Marc who has played on four of Costello’s earlier albums, that really drive the more raucous numbers. Take the tile track for instance. 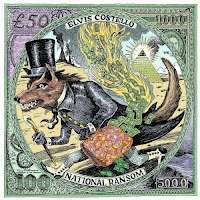 “National Ransom” is a blazing barnburner led by Marc’s electric guitar, Steve’s Vox Continental, and Pete’s drums. From the first track, Costello introduces the album’s tension by perfectly marrying the lyrical passion with the musical intensity. The same connection can be found on “I Lost You,” “My Lovely Jezebel,” “Five Small Words” and “The Spell That You Cast.” Even when the electrics guitars and organs are replaced with violin, mandolin and dobro, songs like “Stations of the Cross” and “Dr. Watson, I Presume” fit in perfectly with the album’s groove. But Elvis has shown time and time again that he can’t be contained to just one vibe or genre. He goes for a little crooning jazz on “You Hung The Moon,” a country coffeehouse subtleness on “Bullets For The New-Born King” and some Tin Pan Alley vaudeville on “A Voice In The Dark” and “Jimmie Standing In The Rain.” To add another layer to the album’s scope, each song is supposedly set in a different location and era, each of which are outlined in the liner notes. While the extra context isn’t necessary to enjoy the songs, it’s fun to get into Elvis’ mind a little more and he’s easily earned the right to stretch and unroll his ideas and vision in whatever ways he chooses to. National Ransom proves that Elvis’ pen is as sharp as it ever was and that his ear is still one of the best. After almost 30 studio albums, the man not only still has it, I think he’s gaining more of it. My hope is that if he feels Nashville is a good enough place to record in, then it’s a good enough place to tour in.